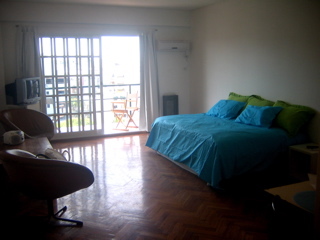 This is an ample and bright Studio, located in Plaza Guadalupe, in Palermo, nice area surrounded by many coffe-store, restaurants. It has a lovely balcony with a great view to the Plaza. There is a double bed, armchairs and a dinning area. The kitchen is fully equipped and the bathroom is complete with bathtub and shower. Subway, Bus Stop, Gym, University, Church, Cinema, Shopping Mall, Park, Square, NightLife area, Market, Residential Area, Commercial Area, CyberCafe, Bank, Exchange House, Bookstore. Included: All utilities, telephone, building taxes, and cable TV are paid by owner.